Symbols on the side of the Bus are matched with symbols on stickers which are applied to your toothbrushes. Young children can then recognise their own toothbrush. 4 sets of 10 toothbrush stickers are included with each Bus purchased. There is also space to write each child's name on the Bus next to their toothbrush. Choose from 3 styles of Bus that use different symbols: ANIMAL, PEOPLE or HEALTHY SNACKS. To view the different symbols, click on the 'Symbols/ Wallcharts' link in the border on the left of this page. 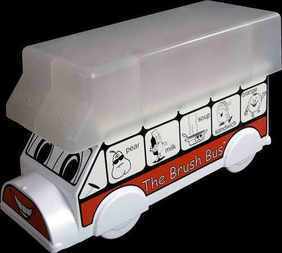 An optional Brush Bus Coveris available to protect your toothbrushes. Toothbrushes and Covers are not included with the purchase of a Bus but are sold separately. 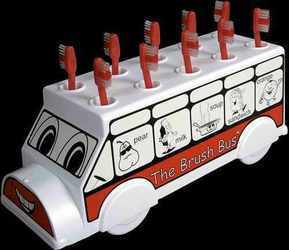 Please note: Most children's toothbrushes will fit the Brush Bus but there are a few that will not. All the toothbrushes we sell are suitable.